Another year of the RSPB’s internal competition to find the best passage wader site, The Golden Wellies, has come to a conclusion. There are both league and knockout elements to the competition to test good wetland management throughout the year. Monthly counts of waders are recorded; they have to be ‘feet down’ on a managed fresh/brackish scrape or flood (not tidal). The Premier League champions are, yet again, Frampton Marsh (photo top). Frampton recorded 33 species, just ahead of Minsmere (31), Deane Valley (29) and Dungeness (29). 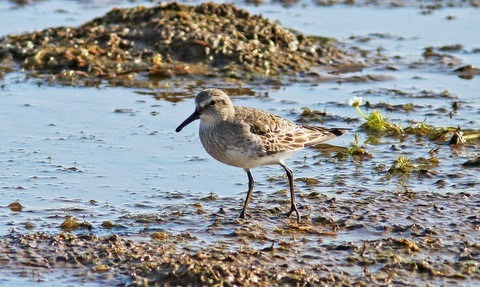 The highlights of Frampton’s year included Lesser Yellowlegs, Dotterel, White-rumped Sandpiper (photo above), as well as 4 Pectoral Sandpipers, 6 Temminck’s Stints and both Red-necked and Grey Phalarope. Frampton had an average monthly peak of 5,018 waders of 25.6 species, compared to Minsmere’s 481 waders of 23.4 species. Snettisham records the most waders monthly – an average peak of 33,000 birds, but only averaging 14 species a month. Middleton Lakes had a storming year, topping The Championship with 29 species (including Pacific Golden Plover, Pec Sandp and Temminck’s Stint) and winning the ‘most improved site’ prize. They are promoted to the Premier League along with Blacktoft (29) and Saltholme (28). Langford Lowfields (22), Ynys-hir (20) and The Reef (18) were promoted from League One. Middleton Lakes and Dearne (Old Moor) again demonstrate that well managed inland sites can compete with coastal sites in terms of wader diversity and numbers. In all, 43 species of wader were recorded during the year, with a peak monthly count across all sites of 106,021 birds being recorded in September. Monthly peak counts included 10,682 Black-tailed Godwits and 481 Whimbrel in April, 14 Black-winged Stilts in May, 288 Greenshank in July, 125 Curlew Sandpipers and 98 Little Stints in August, and 14 Pec Sands and 38 Jack Snipe in September.